HTC One V Accessories are now available in the market, the phone already rock in the market and loved by users. HTC One V need accessories to improve productivity as well protection from damages that happen in daily routine. The Phone launched worldwide and its youngest boy in the HTC One series. Screen protector and Cases are the must have accessories HTC One V owners should buy because scratches on display and phone drop are very often in daily life and we don’t want to ruin the stylize phone. HTC One V needs screen protector to save your display from scratches and dust. Skinomi TechSkin carbon Series screen protector specially made for HTC One V which easy to install and does not require liquid or solution to install. Carbon Fiber texture gives your device a superior, high-tech look and feel. The Skinomi comes with manufacturer lifetime warranty. We often drop our phone and back cover also need some protection. The official HTC One V HC C750 Hard Shell – Black is designed for One V and provides robus protection against bumps, knocks and drops. 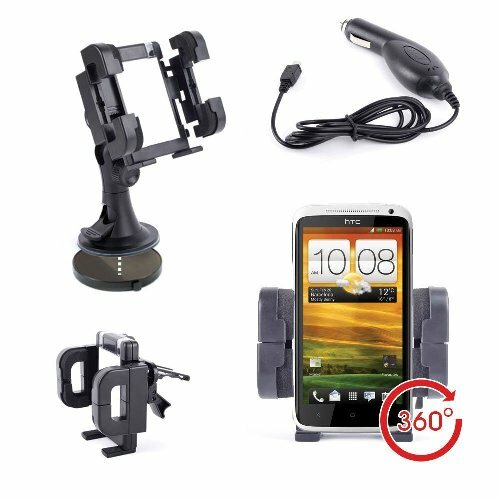 HTC One V can also be uses as a navigator or t.v while travelling in your car and for that you need car dock obviously with charger. The Car mount allows you clear visibility and finger tip access to your device. It comes with both vent and windscreen mounts to vie you plenty of choice. It has quick release side button for easy removal of phone, non-scratch and no-slip design extra thick rubber pads on side retainers to protect your phone, Vent clips adjust for vertical or horizontal vents and in car phone charger to give continuous backup.